Of Course Greenbox Memphis Begins Outside The Box! Check the list below if you need to rent moving boxes in your city! We LOVE hearing from our customers! Do you have a testimonial you want to add? We would love to feature you too! Greenbox is a new and better way to move. Our formula is simple: to deliver a useful, well-built product backed by excellent customer service. Just order our environmental friendly moving boxes online and we will deliver them (and other helpful supplies) to your doorstep. When you’re finished, we come pick everything up, helping you lower your moving expenses greatly. It doesn’t get much easier than that. In the fight against (soggy, smelly) cardboard, become a pro-boxer. 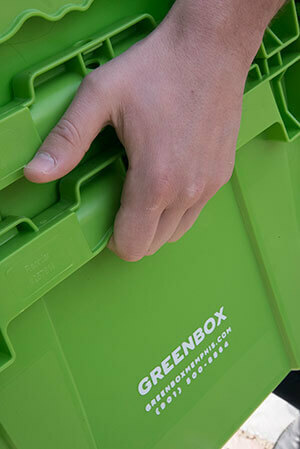 Reserve our recyclable moving boxes, go Greenbox today! We’ve moved a lot – from California to Memphis, TN with stops in-between. Our transcontinental life presented a variety of opportunities to experience the inconvenience, hassle and waste in finding, building and ultimately disposing of cardboard boxes. I knew there had to be a better way! Observing a variety of industries that use plastic nesting boxes sparked the idea for a sustainable solution to cardboard moving boxes. 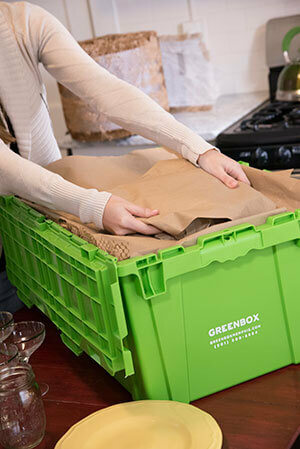 We formed Greenbox Memphis to bring you this convenient, innovative and eco-friendly way to pack and move your home or office. It’s a smart move for both you and your community, because Greenboxes can be used about 400 hundred times before being recycled. It is our Vision to innovate the way Memphis packs and it’s our Mission to bring more smiles and a less stressful packing experience; one Greenbox at a time. Our boxes are not just any plastic moving boxes. They are reusable, clean and absolutely ready to pack the second you receive them. Reserve your Greenboxes today.